Did your city wear PINK today? PINK Shirt Day originated at a high school in Nova Scotia eight years ago. Travis Price was in grade 12 back then and a student three years younger was being bullied on the first day of school simply for wearing a pink shirt, and that didn’t sit well with Price and his friend David Shepherd. They went out that night, bought 75 PINK tank tops and encouraged as many of their classmates as possible via social media to wear the colour the next day. “We didn’t know what was going to happen. We didn’t know if we’d be the only two in pink or if everybody would be in pink. We show up the next day, we were a school of 1,000 kids, and about 850 kids showed up that day wearing pink, and Pink Shirt Day was born just from that simple act of kindness,” Price explains. Incredible. I love how those boys used the power of positive action to subvert a hugely negative force like bullying. Eight years later, Pink Shirt Day has come to be recognized as an international symbol against bullying. Every school in our city promotes and celebrates wearing pink. My son’s school sells PINK lemonade at lunch hour all week with proceeds going to the Kids’ Care Club fundraising for helping low-income families in our neighbourhood. My daughter’s school held a “Friendship Dance” with fundraising also. Even if you didn’t wear a PINK shirt today, you can learn the sign! 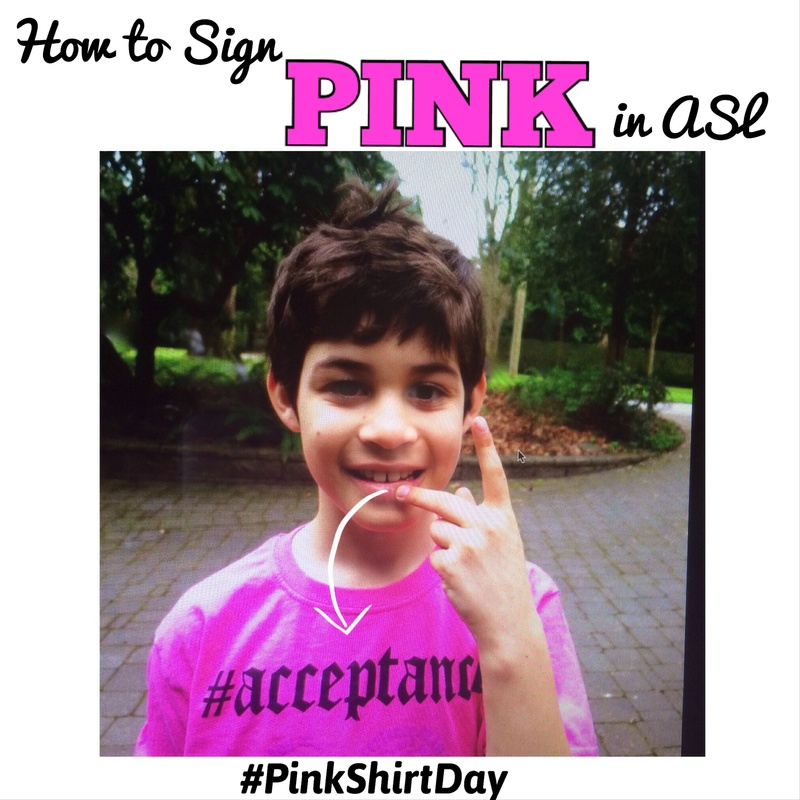 To sign PINK in American Sign Language, slide the tip of your middle finger down your lips. Today is the beginning of the new Lunar New Year for 2015, a calendar Chinese people have used since 2600 B.C when the mythical Yellow Emperor, or Huang Di, started the first cycle of the Chinese zodiac. According to legend, Huang Di named an animal to represent each year in a 12-year cycle that includes the rat, ox, tiger, rabbit, dragon, snake, horse, goat, monkey, rooster, dog, and pig. But there seems to be some reticence in North America to call it the Year of the GOAT, and choose instead a more “sexier” animal, the “Ram”, or even the softer, fluffier “Sheep”. Is it the Year of the GOAT, Sheep, or Ram? I think many in North America consider the GOAT to be a bit banal, a lowly animal un-befitting of the majesty of the Lunar New Year, but the GOAT has always been a very well-respected animal in Chinese culture and history. Since ancient times, the goat became closely linked to Chinese people’s livelihood. Its meat and milk are highly nutritious, and its wool makes fabric that is lightweight, soft, and has other good properties. Chinese people also learned to use its fleece to make writing brushes and its skin to keep warm. The Chinese character 羊 (yáng), which generally refers to a GOAT, is considered a symbol of auspiciousness, good luck, and peace. Since ancient times, people have used 羊to symbolize good-naturedness. 羊 is among the animals that Chinese people like most. It is generally gentle, calm, and quiet by nature and is a source of many things that benefit humankind. 羊 is close to the meaning of good things. As such, it is used in many Chinese characters to indicate something beneficial. The most striking characteristic of the GOAT is its peaceful manner and so Goat people tend to be lovers of peace who prefer to avoid disagreements. Thus, the Year of the GOAT is a time for people leave conflicts behind and to get along peacefully. Those born in the Year of the GOAT (1931, 1943, 1955, 1967, 1979, 1991, 2003, or 2015), are said to be creative, intelligent, dependable, and calm. GOATS are comfortable being alone with their thoughts, are seen as calm individuals. Their personalities are quiet, reserved, and soothing. They tend to be easygoing and relaxed. GOATS enjoy being part of a group, but prefer staying out of the limelight and letting others take center stage. They are nurturing and pensive. 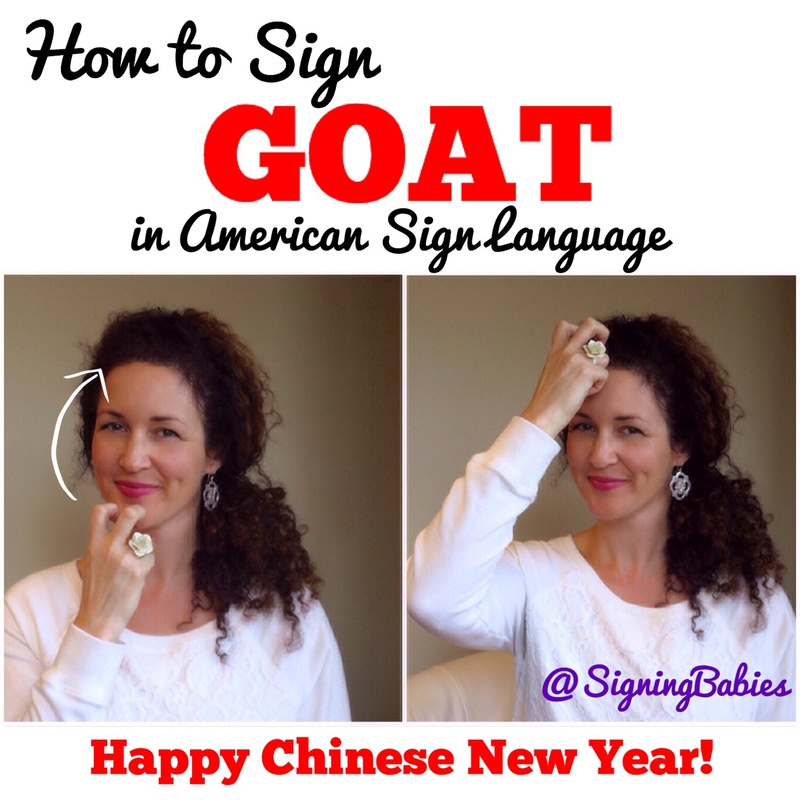 To sign GOAT in American Sign Language, tap your first two bent fingers (like the horns of a GOAT) to your chin and then tap forehead. Gung Hei Fat Choi (Happy New Year)! What do you think –GOAT, Ram, or Sheep? Hold up your hand with index finger, pinkie finger, and thumb extended. 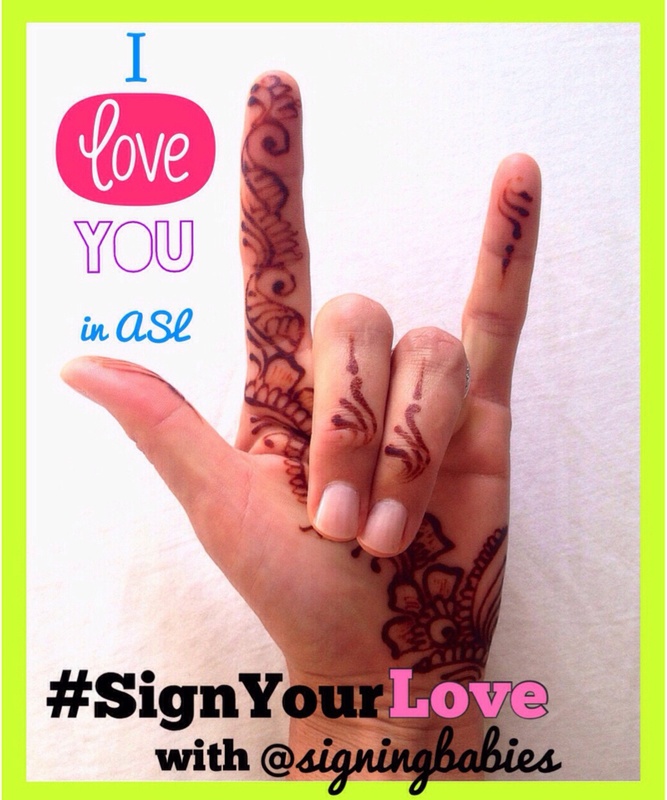 I’m challenging you to teach someone you love how to sign ‘I LOVE YOU’ in American Sign Language. Let’s learn and teach and spread some love this month! Send me a photo of those hands – little or big – signing ‘I LOVE YOU’ on my I LOVE YOU CHALLENGE post on Facebook and Instagram for your friends and family to see & like. Make sure to tag @signingbabies and use the hashtag #SIGNYOURLOVE. Be creative, make it cute, and show them how to sign. I’ve got some prizes to send some love back to those whose posted pics get plenty of likes on my sign language lovefest! Please post your photos by midnight PST Feb. 14, 2015. Spread the love by sharing & tagging your friends so they can play & learn ASL, too!